Summary: We mentioned last week how we are in love with the Conscious Cleanse. It is a cleanse that detoxifies your body, inside and out, as well as your mind and your environment, all while letting you eat all kinds of delicious food. We mentioned last week how we are in love with the Conscious Cleanse. It is a cleanse that detoxifies your body, inside and out, as well as your mind and your environment, all while letting you eat all kinds of delicious food. 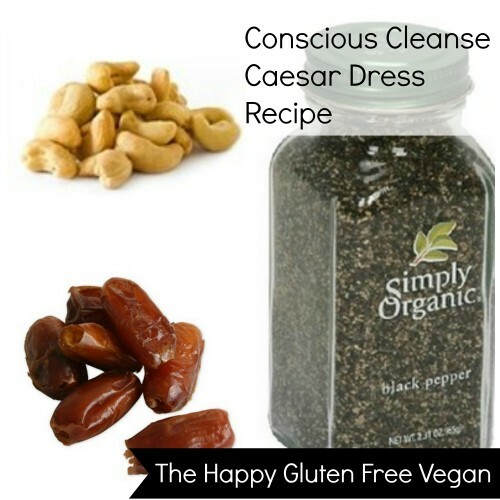 One of the recipes we were most excited to see was for vegan and gluten free caesar dressing. Traditional caesar dressing is not vegan, and sometimes not gluten free. This recipe is not only vegan and gluten free, but full of whole foods to nourish your body. Blend all ingredients in a high-speed blender. Transfer to a glass container and refrigerate. The Conscious Cleans advocates preparing your salads ahead of time so that they’re ready to go when hunger strikes, just be mindful not to dress the salad until you’re just about to eat it so that your vegetables don’t get soggy.